While most Disney World table-service restaurants have some healthy kids’ meal choices, parents have recently been able to find the same at Disney’s counter-service restaurants. 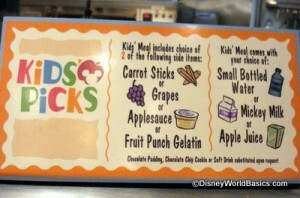 At most Disney World quick-service restaurants, you can now find a program called “Kids’ Picks.” This program not only gives kids the option to customize their counter-service meals with healthy choices, it also makes those healthy picks the primary options! Here’s how it works: when you and your child approach a Disney counter-service location, your little one can choose from the standard kids’ meal entrees available and then choose from the list of kids’ picks for side items and drinks. The primary options listed as side items are relatively healthy choices: usually dishes like fruit gelatin, applesauce, apple slices, grapes, and carrot sticks. For a drink, your child is given the main options of milk, water, or apple juice. Now, in small print, the kids’ picks signs will always give your child the choice of adding standards like french fries, chocolate pudding, cookies, or soft drinks, but these are cleverly hidden below the giant cartoon images of the healthier options. It’s just one more way that Disney is redesigning their dining and upgrading their menus resort-wide to give you and your family healthier choices for theme park food. Guess What! This post is part of the DisMarks Disney Blog Carnival! Click on that link to see many more fantastic blog posts about Disney food, planning, history, and more. This entry was posted on Thursday, April 1st, 2010 at 9:40 am	and is filed under Dining. You can follow any responses to this entry through the RSS 2.0 feed. You can leave a response, or trackback from your own site. Wouldn’t that be great, Gray?! Put the french fries in small print! !